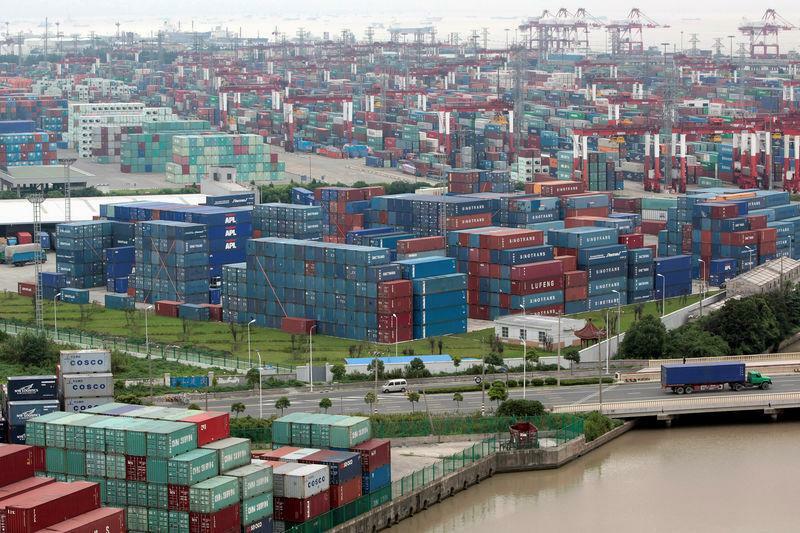 BEIJING (Reuters) - China's exports are expected to have maintained solid growth in July despite new tariffs on billions of dollars of shipments to the United States, though the outlook has darkened as both sides raised the stakes in a trade conflict that has rattled financial markets. Economists say that tariffs on $34 billion of China's exports to the United States, which went into effect on July 6, so far are not having a significant impact on overall Chinese exports. July exports are predicted to have risen 10 percent year-on-year, according to median estimates from 37 economists, compared to 11.2 percent growth in June. While July's forecast does not point to any sharp slowdown, economists do see headwinds mounting for China's massive export sector. "In addition to the tariffs impact, there might be some impact from front-loading of orders in previous months," said Betty Wang, Senior China Economist at ANZ in Hong Kong. "There will be some gradual impacts that could be seen over the following months, as this is the first month the tariffs were implemented." ANZ forecasts China's exports rose 6.4 percent in July. Markets will be closely watching the data on two-way trade between the world's two biggest economies, as well as China's trade surplus with the United States, a sore point in the trade relationship. The $34 billion of Chinese exports impacted by current tariffs amount to less than 7 percent of its total exports to the United States last year. Trump, however, has effectively threatened to slap tariffs on all of China's shipments to the United States, the Asian giant's largest export market. China's surplus with the U.S. swelled to a record in June as exports continued to rise, though signs of front-loading orders suggest the spike may have been a one-off. China's imports are expected to have risen 16.2 percent in July, picking up from 14.1 percent growth in June. The poll showed China's overall trade surplus likely fell to $39.33 billion in July, from $41.61 billion in June, though that amount would be China's second-highest surplus of the year. There was no separate forecast on China's trade surplus with the United States which has continued to grow even as its total surplus has narrowed over the last two years. "China has made it very clear it is going to boost infrastructure investment for the second half of the year," said ANZ's Wang. "That would support overall GDP growth momentum even though we see more downside risk and uncertainties around the export sector."